Here’s a service opportunity that benefits your group as well as the residents of Central Union Mission! Ready2Recycle is a work development program that employs homeless men to pick up, sort, and manage donations, which are then used to help provide products and services for the vulnerable people we serve. 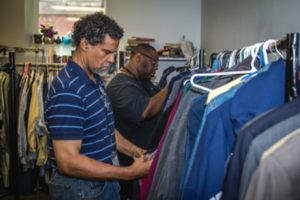 The men employed by Ready2Recylce gain valuable work experience while earning and saving their salary to help secure permanent housing. Who can do a Ready2Recycle drive? A Ready2Recycle drive is good for any group: scout troops, Sunday school classes, service clubs, youth groups, office groups—whoever has extra “treasures.” It’s a wonderful way to get people working together! Schedule a pickup date and location for your group with our manager TaJuanna Ervin at tervin@missiondc.org, 202-745-7118, ext. 411, or complete the form at the bottom of this page. Clean out your closets! We can use all types of clothing, shoes, housewares and appliances. We can even use torn or stained clothing to sell for rags. At your pickup location, our polite staff will help you load up our Ready2Recycle truck and give you a receipt for tax purposes. You now have a clean house, a tax deduction and the good feeling that comes from helping homeless people earn income and gain job references. Sorry, no computers or monitors. We are not equipped to recycle them.